The Davenport Lounge has added an exclusive new night of entertainment every Wednesday featuring Jeremy Davenport. M bistro is planning to provide a luxurious Easter Feast like no other while The Ritz-Carlton Spa, New Orleans has Crescent City Classic runners covered with a variety of offerings. Below is a list of all of the events happening in and around the luxury hotel. The Davenport Lounge is proud to offer a new one of a kind Wednesday night experience. Every Wednesday night, the lounge will be buzzing with live jazz from Jeremy Davenport (5:50 p.m. – 9:30 p.m.) and a special food and drink menu, featuring small bites and tasting size portions of small batch American Whiskey’s and Wines. This unique Wednesday night offering provides guests with the opportunity to taste and experience new flavors, all while enjoying music from one of New Orleans’ favorite entertainers. Summer is considered off-season in New Orleans, so travelers should plan a trip to the Crescent City. Rates start at $199, based upon availability. Every weekend, The Ritz-Carlton, New Orleans Farmer’s Market will offer guests an opportunity to sample local products from Louisiana’s farms and coastal waters. From beer made with Ponchatoula strawberries, to Louisiana crawfish bread, these seasonal offerings will give guests the opportunity to learn about the local ingredients that make Louisiana’s cuisine so unique. Guests of all ages are invited to join us in the Davenport Lounge for a special Easter celebration featuring an appearance by Peter Cottontail. Children will enjoy cookie decorating, an Easter Egg Hunt with Peter Cottontail and other special treats. Gather with family and friends for a spectacular Easter Brunch in M bistro. Guests will enjoy an enhanced four-course menu featuring a seafood buffet, dessert station, unlimited champagne and live entertainment. Children will enjoy cookie decorating and a special visit from the Easter Bunny. There is no better Mother’s Day gift than the gift of relaxation. Mothers and Daughters can enjoy a day of pampering and relaxation in the award winning Ritz-Carlton Spa. Celebrate the special mother in your life with an elegant tea in The Davenport Lounge and an extravagant feast in M bistro. The annual Crescent City Classic 10K is a premiere road race that draws runners from all over the United States. The race course is one of the most scenic of its kind and culminates with an end of race party. Recovery: The Ritz-Carlton Spa, New Orleans specializes in post-race detox, rehydration and relaxation. Location: The race starts at The Mercedes-Benz Superdome and ends in beautiful City Park. The hotel is within walking distance to French Quarter Festival, the largest, free, outdoor festival in New Orleans. It features 22 outdoor stages showcasing gospel, jazz, funk, classical, Cajun and zydeco, brass bands and much more. Participation: Catch Jeremy Davenport (presented by The Ritz-Carlton, New Orleans) on Sunday, April 13th at 12:30 p.m. at the GE Capital/Technology in NOLA Big River Stage. Location: The hotel is in walking distance to the festival (2 blocks). Background: Thousands flock to this seven-day event that has been heralded as one of America’s best festivals. Headliners include: Eric Clapton, Bruce Springsteen and the E Street Band, Christina Aguilera, Phish, Arcade Fire, Santana, Robin Thicke, Trey Songz, and many more. Participation: Jeremy Davenport will perform on Saturday, April 26th at 2:50 p.m. in the Zatarain’s/WWOZ Jazz Tent. In 1991, a group of local wine and food professionals had a vision of creating a series of events to raise money for charity. The five-day festival brings together world-renowned winemakers, celebrated chefs and industry insiders. Known as “the party with a purpose” the three-day festival features empowerment seminars at the Ernest N. Morial Convention Center during the day and concerts in the Mercedes-Benz Superdome over three nights. Headliners include: Prince, Mary J. Blige, Lionel Richie, Charlie Wilson, Jill Scott, The Roots and many more. New Orleans is the “home of the cocktail” so it seems only fitting that this internationally acclaimed festival of cocktails, cuisine and culture would be held in New Orleans. This premier American jazz festival dedicated to the life, music and legacy of New Orleans’ native son, Louis “Satchmo” Armstrong is free and open to the public. 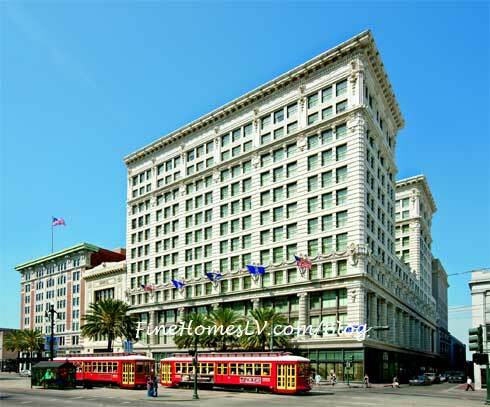 The Ritz-Carlton, New Orleans is located at 921 Canal Street, New Orleans, Louisiana, 70112 . For more information or to make a reservation call 1-800-241-3333.